Whether one views Mao Zedong as a hero or a villain, the `Great Helmsman' was, undoubtedly, a pivotal figure in the history of twentieth-century China, a man whose life and writings provide a fascinating window on the Chinese experience from the 1920s onward. 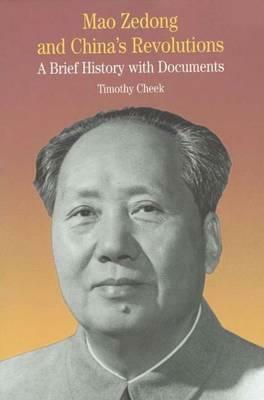 Part Mao biography, part historical overview of the turbulent story of China's Communist revolutions, the introductory essay traces the history of twentieth-century China, from Mao's early career up to the Chinese Communist Party's victory in 1949, through three decades of revolution to Mao's death in 1976. The second half of the volume offers a selection of Mao's writings - including such seminal pieces as "On New Democracy" and selections from the Little Red Book - and writings about Mao and his legacy by both his contemporaries and modern scholars. Foreword.- Preface.- PART I : INTRODUCTION: THE CONTINUOUS REVOLUTIONS OF MAO ZEDONG.- PART II: MAO DOCUMENTS.- 'Just a Few Words', October 25, 1966.- PART III: DOCUMENTING MAO.- Appendices.- Chronology.- Questions for Consideration.- Selected Bibliography.- Index. TIMOTHY CHEEK is Associate Professor of History at Colorado College.